Airbrushing with acrylic paint is extremely versatile as acrylics are available in both opaque and transparent forms. Acrylic paint is very safe to use. It is water-based and does not have fumes or an odor making it safe to use indoors with little ventilation. Using acrylics the artist can render a variety of textures and layering, giving their work depth and clarity. Mixing acrylics for airbrushing will be easy if you follow a few simple steps. Purchasing acrylic paint specifically made for airbrushing is the easiest, most concise method of acrylic airbrushing. Usually, these types of acrylics have acrylic airbrush thinner included with them, or readily available where airbrush acrylic is sold. Simply mix according to the brand’s instructions, which are included in the package, to achieve the look you want. 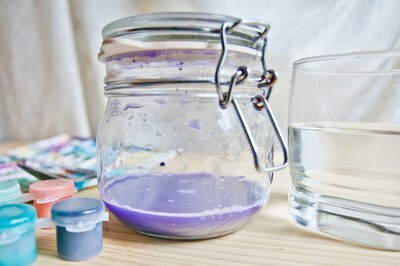 Thin acrylic paint with water, using a 50-50 mixture of water to acrylic paint. Be sure to mix well. To achieve this, shake well by placing the mixture in a tightly lidded container and shaking briskly for a few minutes, or place mixture in a large measuring cup and whip with a mini whisk (available in the house-wares section of department stores). 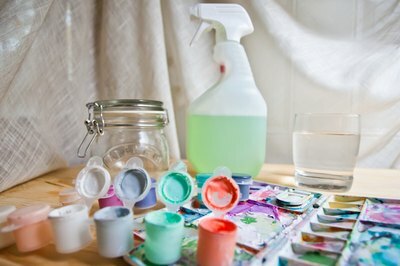 Use rubbing alcohol or Windex to thin acrylic craft paint (available at hobby stores, WalMart, and craft shops) are inexpensive (as little as 77 cents per bottle) and can also be used effectively for airbrushing. Simply thin with a 50-50 mixture of rubbing alcohol or Windex (reported to make the paint stick better), and spray through the airbrush. Airbrushing with metallic acrylic paints can be achieved by thinning using any of the steps above, depending on the size of the metallic flake in the paint. Inexpensive craft acrylics have very small flake and can be used most effectively. Shake or whisk the paint mixture often as pigments have a tendency to settle. Acrylic paint has a tendency to clog, with paint building up at the opening of the nozzle. This build-up can result in spattering. Be sure to flush clean water through the airbrush periodically to avoid build-up. Avoid using Windex to thin white paint, as it may tint the paint blue. Use water or rubbing alcohol to thin white paint. 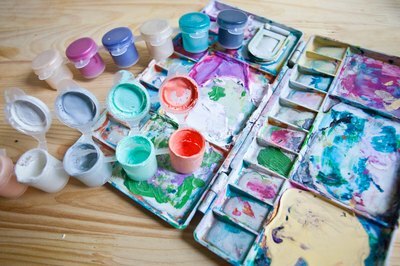 Adding alcohol to your paint creates fumes and odor. Take care to use ventilation when using alcohol, or alcohol-based substances. Can You Airbrush With Acrylic Craft Paints? How Do I Spray a Latex Paint With an Air Brush?